So it’s been a while since I’ve written one of these posts, but this weekend, I definitely had something worth posting about! Those of you who follow me on Twitter may have seen my photo of an astronaut next to the getup he wore while climbing Mt. Everest. This was just one of the fascinating people I got to meet and exciting projects about which I learned on Sunday. 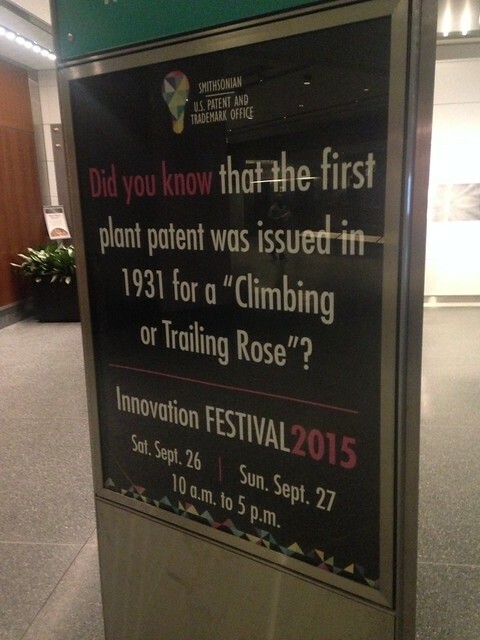 The Innovation Festival is a joint venture between the US Patent and Trademark Office and the Smithsonian National Museum of American History. The NMAH recently opened its Innovation Wing, where they showcase inventions and inventors that changed the world. The permanent collection features things like the bicycle and ready-to-wear clothing alongside the telephone and computer. It’s a really neat exhibit, even when there isn’t a festival going on. But add in a wing full of inventors sharing their new patented inventions and you have a recipe for a very fun day. 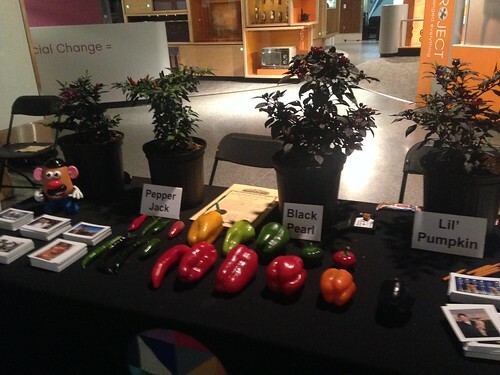 Among the inventors I met were USDA scientists showing off ornamental pepper plants. This guy was really interesting. Apparently he came up with his first patented plant at the age of 10, and now works for the USDA playing with peppers. He was a natural at outreach, and even had a fun analogy for describing how genetic modification works. He said it was like Mr. Potato Head: you can choose which parts you want to add or change. And he brought along a few types of pepper plants to show what he meant. Probably the coolest thing I learned from them is that there is one gene site that controls whether or not a pepper is spicy, and then a bunch of other ones that describe how spicy it is. So you can flip on the spicy gene in a regular bell pepper, which kind of confuses people. One of the other guys there said that he’s been “burned” more than once taking peppers home from work! I also met some guys developing workout clothing with built-in resistance bands, scientists who developed a new kind of gel for biological sciences, scientists who created an adaptive algorithm for finding interesting articles for people, and engineers who came up with a more intuitive way to back up a truck trailer, among many others. The most interesting thing was that not everyone was developing a thing or a device, and not everyone was an engineer. There were biologists, astrophysicists, chemists, and skateboarders! The only thing they had in common was that they had an idea. Then, I also spent my afternoon at the education and outreach booth, where we shared projects with the younger visitors that taught them about different inventors and inventions. The coolest thing there (besides the inventor trading cards!) 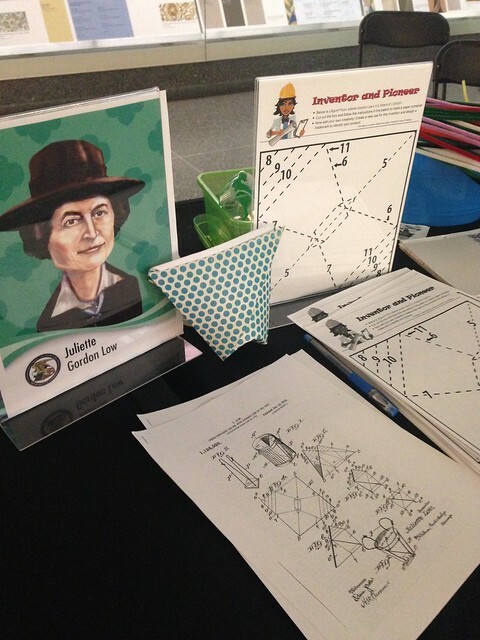 was the paper-folding project using a 100-year-old patent held by Juliette Gordon Low, the founder of the Girl Scouts. Apparently, Low came up with a way of folding a flat piece of paper into a receptacle for holding garbage, including liquids. Even though I was a Girl Scout, I never knew our founder was an inventor! All in all, this was such a fun event. I’d definitely go back as a guest, and certainly volunteer again. 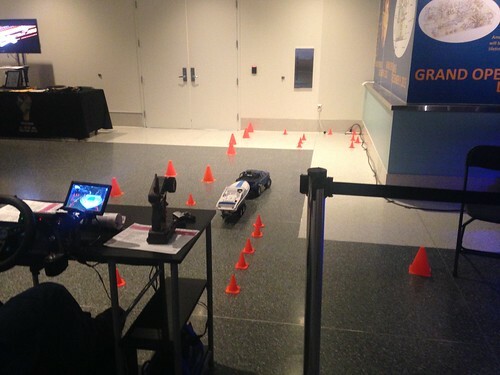 It was an event that showed the wide variety of science and invention and really got everyone excited about it!